Maguy Le Coze and her late brother Gilbert began working at their parents’ restaurant as teenagers, she in the dining room and he in the kitchen. In their 20’s, they moved to Paris and opened a restaurant called Le Bernardin, in honor of an order of monks devoted to food and wine. They used generations-old family recipes and asked their parents to send fresh local herbs from their garden in Brittany via train to the restaurant, which quickly became very successful. In 1986, they brought the restaurant to New York City. Eric Ripert, born in Antibes, started to learn about food in his grandmother’s kitchen, developing his Mediterranean palate from an early age. His family later moved to Andorra, where his expertise grew to include Spanish flavors. He has been working at Le Bernardin since 1991 and became a part owner in 1996. Inspired by her home in the small fishing village of Port Navalo in Brittany, Maguy replicated the cozy, nautical atmosphere at Le Bernardin. The maritime motifs of the paintings and long vases of fresh-cut flowers add a touch of intimacy and comfort to the ambiance, which is a challenge in the typically stuffy and hectic Theater District. Le Bernardin and all of its 3-starred Michelin peers have been on our dining wish-list for a while. 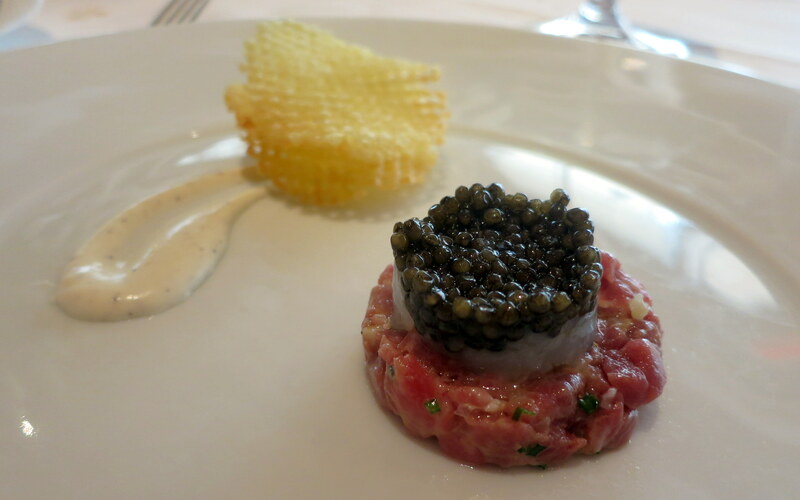 Jen and I were lucky enough to try per se about a month ago, and I couldn’t resist an opportunity to eat at Le Bernardin when one of my friends was in town and suggested it. At this rate, maybe I’ll be done with all the 3 stars by year-end! Herman and I went all out and ordered the Chef’s Tasting Menu with the Wine Pairings to maximize our visit. We were satiated by the end of the delicious meal, but not awestruck by the food. The wine pairings were skillfully chosen, but I think my personal preference is to enjoy a bottle of wine throughout dinner, instead of hopping glass to glass, overwhelming the taste buds. My second venture into this seafood haven was with Jen and two clients who appreciate good food as much as we do. 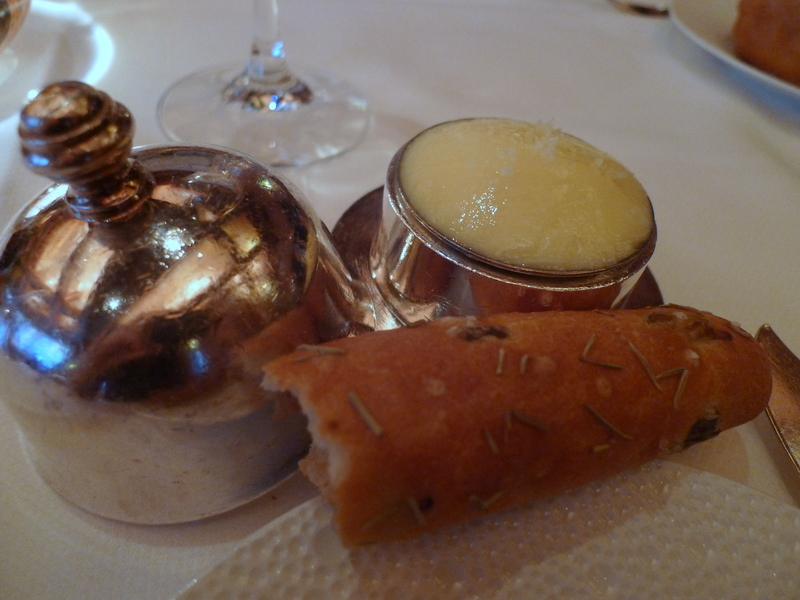 I think serendipitous would best sum up the fact that I got to dine at Le Bernardin twice in the last month! 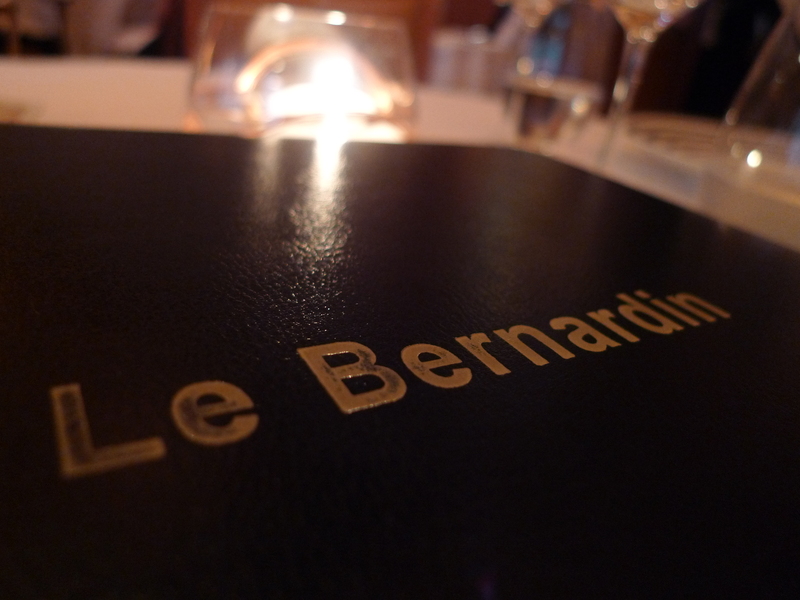 We decided to try the regular Le Bernardin Tasting Menu, since I had already had the Chef’s Tasting. But we did add the poached egg and osetra caviar dish à la carte; it did not take any effort to convince my dinner group that the dish was a must. We opted out of the wine pairing and instead decided on a couple of bottles of white wine — the 2009 Hubert Veneau was particularly exquisite: citrusy and fresh, but not too dry nor too sweet. As expected, the service was excellent as was the food. The choreography with which the courses arrived on our table was impressive. I admit I prefer the regular Tasting Menu to that of the Chef’s, with the caveat of the added Poached Egg course. The Tasting Menu opened stronger with the oyster amuse bouche and carried on that momentum with every dish, whereas the Chef’s Tasting, was less consistent. My personal preferences of tuna tartare over any preparation and penchant for meat also obviously skew my review. One of my favorite details was the wine tasters (small metal chalices on chains) that the sommelier and his team wore around their necks. I hadn’t seen these at other high-end restaurants before, and the sommelier was very excited to talk about what he dubbed his “bling”. I want to swim in that poached egg course..!